We’ll skip ahead to the steps in a little bit, but firstly, what is a client certificate? This site goes into a decent explanation of the UX problems with client certificates. This mail is intended for the person who owns a digital certificate issued by the StartSSL™ Certification Authority (http://www.startssl.com/). The Class 1, client certificate for StartCom Free Certificate Member and serial number CCAEB is about to expire in about two weeks. Please log into the StartSSL Control Panel at https://startssl.com/Certificates and get a new certificate for this purpose. Failing to update your client certificate might result in the loss of your account. The confusing thing here is that this is also often the date of expiry for your server’s certificate, if you created your client cert and generated a server SSL cert around the same time. Go to “Certificates Wizard” and in “Select Certificate Purpose”, select “Client S/MIME and Authentication Certificate”. Aside: This is my first gripe with this workflow. It could be improved to a simple “Create New Client Authetication Certificate” button that just automatically takes you to the menu. To create a new Client Certificate, you have to generate a Certificate Signing Request. I don’t understand this process in depth, but basically, you give them a private key encrypted with a password and they sign it and give you a certificate. This is your client certificate - the next time you log into startssl.com, the site looks at it and says, “Hey, we can verify that this has been signed by Mandar!”. You can generate the private key in one of two ways. This will generate a file called yourdomain.com.key that is encrypted using a passphrase (which you will be prompted for). 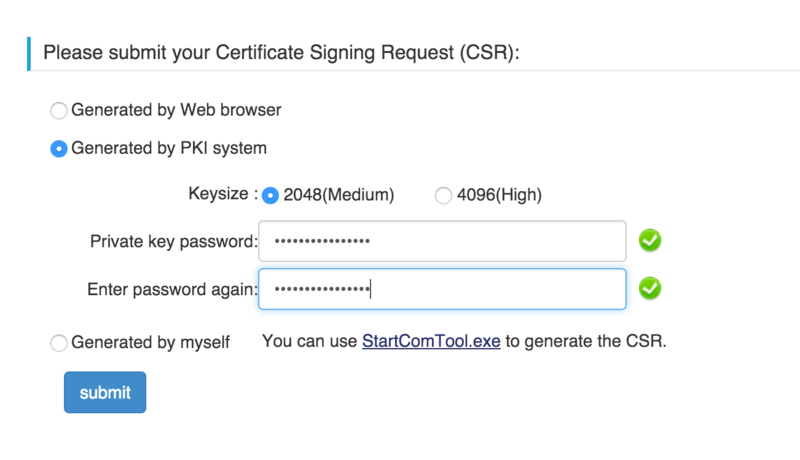 Make a Certificate Signing Request (CSR): This is the part where you tell startssl.com “Hey look, this is a cert signed by me! Validate it please!”. Again, you can do this one of two ways, corresponding to the two ways you generated the cert before. Enter your email (there might be some sort of a validation process here, where they send a unique code to your email that you have to then confirm). Select Generated by PKI System. You will receive some prompts for your Country Name, Locality, etc. – fill those in. Submit your CSR. If you used the website, you should be prompted to download a .key file, which is your private key. Download this, and hit “submit”. This will give you a download of two .crt files. Generate PKCS file for export. Again, you can do this one of two ways, corresponding to the ones mentioned in step 4. From the website itself. If you paste in your key and CSR, the website will generate a .pfx file that you can copy to your computer. On OSX, double clicking this will add your client cert to the system Keychain. to get the the newcert.pfx file. In OSX, dragging this to your login keychain in Keychain Access will work. Ubuntu has something similar, just double clicking the .pfx file worked for me. So there. Once you have your client certificate installed, you can then go to https://startssl.com and log in to generate a new cert for your website with a year’s validity. [^1] I know the Let’s Encrypt project is making this process simpler. It’s in public beta now, so I’ll probably switch over at some point.